The mare on the day of seizure, on October 12 last year. A woman in New South Wales has been fined on two charges laid over the poor care she provided to her thoroughbred cross mare, since rehomed by the RSPCA. Susan Coogan, of Yellow Rock, appeared in Penrith Local Court on Thursday, where she pleaded guilty to failing to provide proper and sufficient food, and failing to provide veterinary treatment. Coogan was fined $A1000 on the food charge and $A250 for failing to provide adequate worming treatment. She was ordered to pay $A162 in court costs and $A489.40 in veterinary costs. 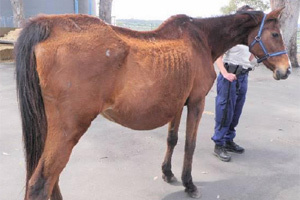 A New South Wales RSPCA inspector located the mare when inspecting horses in a paddock at Mulgoa on October 12 last year. The horse was in extremely poor body condition with a swollen belly, the RSPCA said. The horse was seized and transported for urgent veterinary attention. An abdominal ultrasound confirmed the mare was pregnant. She was found to have a heavy internal parasite burden and a bacterial skin infection. These conditions were treated and she was placed on a feeding program. The mare delivered a healthy filly foal two weeks later and continued to improve in condition. During an interview, Coogan admitted she had been notified about the horse’s poor condition but nothing had been done about it. The mare was surrendered to the RSPCA. Both the mare and the filly have since been rehomed. The charges were laid under the state’s Prevention of Cruelty to Animals Act and Regulations. Another uncaring or blind horse owner, It’s unbelievable how anyone can be so callus. Funny that the RSPCA can do something about just *ONE* horse in the area but many others they don’t give a crap?!?!?!?!?!?!?!?! There are around 5 others that I have noticed that have been neglecting horses for months, years! in the area, yet RSPCA turns a blind eye. The most horrific case is also in Mulgoa, 50 horses emaciated, inbreeding and dying in a paddock. Information and photos about it in link provided.